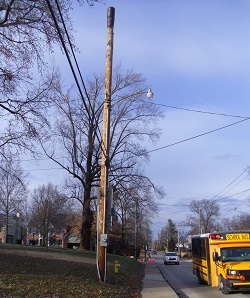 Above: Complete view of light pole now housing a small cell installation, followed by three views of the same pole to allow you to see how small cell technology might look in your neighborhood. Most of our neighborhood leaders are just beginning to learn what small cell technology is, and many of you will learn that from this article. Either way, neighborhood concerns about lack of resident input, aesthetics, or health impacts are likely to arise. We are going to concentrate on appearance issues here, since we figure you already know how to complain about lack of input. Those who worry about health impacts of radio-magnetic fields are more likely to protest on a city-wide scale, so we will not be giving any detail about that potentially important issue. Briefly, small cell technology is a micro (small size) solution to providing mobile phone and data services. The cell phone towers that we are familiar with do the same thing, except they are called macro because they are mounted high on a tower and cover a wide area, whereas small cell typically is mounted on a pole, street light, bus shelter, building, billboard, or elsewhere. As the name implies, this equipment can be relatively small, although as we shall see later, sometimes it isn't small enough to please you if you want to preserve a certain appearance and atmosphere in your neighborhood. Unfortunately in the United States, the deadline for cities to impose aesthetic regulations on this relatively new technology already passed on January 14, 2019. However, the National League of Cities and other organizations are challenging this Federal Communications Commission (FCC) rule in court, so we are writing this article to help you position yourselves if they are able to obtain a delay or even a repeal of this rule. About 20 of the 50 state legislatures also have passed a law limiting the right of local governments to regulate the appearance, spacing, or even the deployment of small cell. You might reasonably ask why there is such a hurry, given that we said many citizens haven't even heard of small cell technology. The answer seems to be that the cell phone and broadband industries are convinced that the small cell approach is essential to rapid acceptance of the speedy 5G technology they are developing now. So the FCC and business interests have decided that it is important to remove every possible obstacle to implementation of this fast internet that can meet the ever-growing demand for cell phone service, broadband internet on every device and in every home and business, and also for the Internet of Things (IoT). In case you don't know about Internet of Things, this terms means the capability of internet-capable appliances, vehicles, building controls, and devices of all kinds communicate with each other without benefit of a human intermediary. In a way this is like the FCC approach to towers, which curtailed the extent of local government jurisdiction over zoning regulation of towers. Our opinion is that the needs of autonomous (self-driving) vehicles for lots of real-time data adjacent to streets are major drivers of both the development of the 5G technology and positive attitude of regulators toward it. Recognize that there are real social benefits to small cell technology. Fast and reliable free or inexpensive broadband by phone would allow everyone with the right phone and data provider to connect automatically in proximity to the small cell, whether they are riding or walking, or whether their homes are near the facility. This may reduce the very negative digital divide situation in our country where poor people have less internet access than those who are better off. 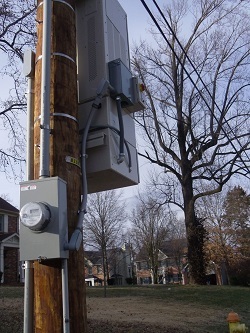 So while many municipal officials feel that the new federal limits on the fee that cities and towns can charge for mounting small cell technology on utility poles don't even compensate municipalities for their real expenses, in the end we think most cities will come to accept that this municipal cost also comes with social benefits for citizens. And neighborhood leaders are well advised that there are many social benefits to allowing everyone with a phone to have some broadband access when they are out and about. Students, job seekers, and just about everyone needs quality internet service to navigate life successfully. What Does Small Cell Technology Look Like? For the sake of simplicity, we won't talk about small cell technology mounted on buildings and such. We are seeing the equipment mostly on utility poles or street lights in our area. Often there's a box the size of a mini-fridge on the pole, and sometimes a power supply in a utility box the size of a small regular refrigerator sits on the ground as well. The challenge for cities and for neighborhoods will be to insist on a good design for these things. A tumor the size of a large cooler it not typically the look that we want to see on our handsome and expensive ornamental street lighting, so the aesthetics of the situation will be worth monitoring closely. 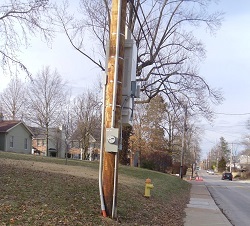 Making matters worse, an assortment of other boxes may be placed on any side of the pole, and they are not necessarily lined up neatly either. 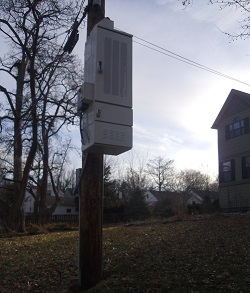 In addition to the main box, somehow the poles must manage to contain an electrical supply, an emergency disconnect box, an electric meter, an antenna, and assorted cabling and conduit from one aspect of the small cell to another. The various cables and wires in themselves can be a real eyesore, especially if allowed to dangle and not neatly tied flush to the pole. We have seen some good attempts to make the pole as unobtrusive as possible. Some companies have managed to stuff most of these elements inside the pole or underground beside the pole, so that the only thing that is visible is a fattening out of the pole by a consistent amount at the top. We've seen an application or two where some part of the small cell technology is effectively hidden on the back side of a banner. In one city we noted a wide ornamental pole base that camouflaged some of the equipment. Sometimes some aspect of the equipment is suspended on an arm protruding out from the pole, and depending on the specifics of the situation, this might be a somewhat attractive solution. In our book, smaller is always better for neighborhoods. If the small cell apparatus can be up high and tucked just under the typical "cobra head" street light, for example, this might be the best solution that you as a neighborhood can hope to attain. However, any neighborhood that has successfully fought for a nice streetscape and ornamental street lighting should object loudly if small cell technology threatens your aesthetic. It is important to try to keep the scale of the small cell compatible with the scale of the pole. Taller and broader diameter poles would be less disrupted by a small cell antenna box than slender poles often supporting pedestrian lighting, for instance. If you are a neighborhood leader facing the rollout of small cell technology along your residential and commercial streets, get in front of this issue right now if you possibly can. Since your town may be powerless to regulate appearance, unless they acted before the January 2019 date, you will need to use your best persuasive powers with a giant corporation if you care about the size, shape, and appearance of the small cell devices. Especially if your neighborhood contains a local historic district, become proactive in informing yourselves about the possibilities now. If you are faced with this situation, find groups and individuals who will join you in putting some pressure on the company. A natural ally may be environmental groups. Environmental activists interested in the radio-frequency exposure issue will take note of this technology, since devices are much closer to the ground and to human activity than the electrical transmission lines they often worry about. Sometimes the small cell controller might be level with a second or third story bedroom window, just a sidewalk width from where people sleep. We happen to think that our nation will come to regret this speedy implementation, and that in a couple of decades or so when the technology becomes obsolete and yet our neighborhoods are full of ugly protrusions on already not-so-beautiful utility poles, we will wish we had been a little more thoughtful. But be that as it may, your job as a neighborhood-scale leader is to make the best of this situation. Prepare yourselves now for what could soon be coming to your own street or your own commercial district revitalization project.